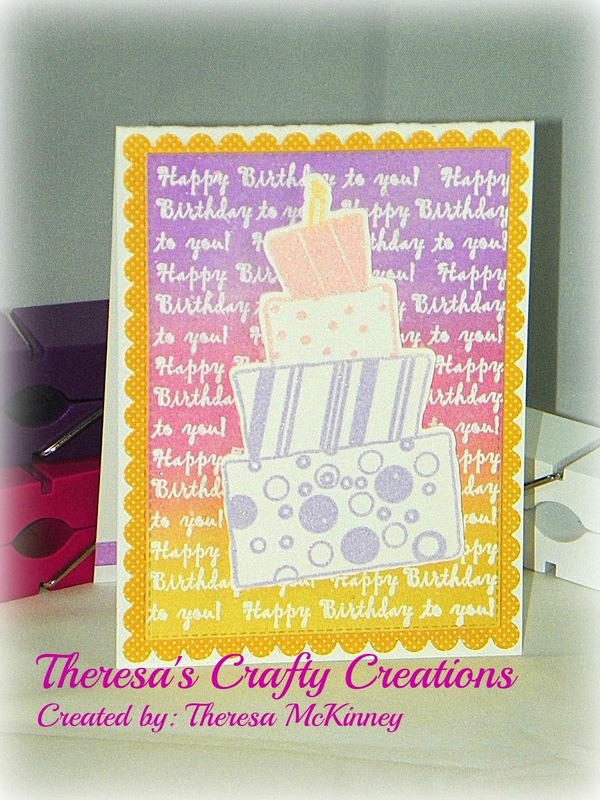 Theresa's Crafty Creations: Happy Birthday to You!!! to color over my embossing - It totally makes the words POP! I think it came out pretty and I love the colors!! This card is so bright and cheery! Whatever teacher gets it will be thrilled. Gorgeous card!! I love the pretty cake, the gorgeous background and the pretty colors!!! Have a great day. Suhc a beautiful card! !Love the cake stamp and embossing! !Awesome job my friend!! You're really something else with those stamped backgrounds. I love how you know just what inks/distressing/embossing methods to use to create such beautiful designs. Really gorgeous background and love the colors!!! I hope you have a wonderful weekend my friend!! Theresa, your card looks great! Thanks for explaining your process; looks like it was a lot of fun to create. I love the cake - gorgeous even though the colors aren't as bright as you'd like! Very pretty card! The background you created is gorgeous! The cake looks so yummy too! So pretty and so much fun! I do love that background print! I just set up my new laser printer and I'm so excited! Back to printing digis! This is such a great technique! I love how there white embossed images pop under the Inks! !